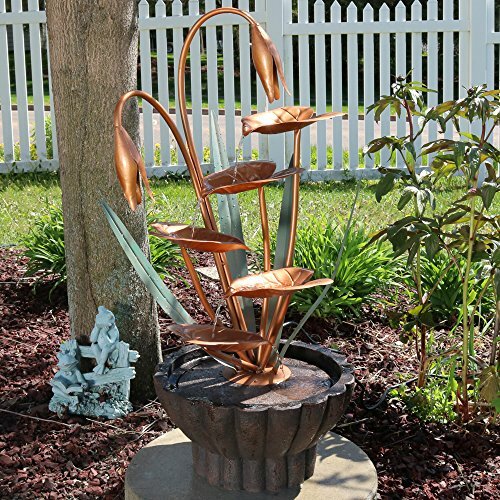 Sunnydaze Copper Flower Petals with Five Tier Leaves Outdoor Water Fountain, 34 Inch, Includes Electric Pump | Fountain City Art Ctr. Welcome your guests with this charming copper outdoor fountain featuring delicate flower petals gently dripping water onto garden leaves. The water "tings" off the petals delicately, creating a sound similar to water pouring on a tin roof. With its elegant appearance and light, peaceful water sounds, this outdoor fountain is sure to create a tranquil atmosphere for your outdoor space. No plumbing is required, all you have to do is plug the cable into a standard electrical outdoor outlet when you would like it to run. Overall dimensions: 17 inches wide x 15 inch base diameter x 34 inches tall; weighs 12.8 lbs. Each petal is 8 inches long. Durable resin and copper construction ensures that the fountain is lightweight and easy to move. Includes one outdoor water fountain and one electric WP-450 submersible pump with 1/2 inch hose diameter. Fountain base is painted dark brown, metal stems and blossoms are painted a metallic copper and the leaves are painted a soft evergreen color so it is sure to add stunning contemporary design to your space. Meadow Log Fountain - Cascading Waterfall Garden Fountain with LED Lights. Realistic Water Feature with Low Splash Design. Pump Included.